Greater Noida (2/2/2019) : Birla Institute of Management Technology, Greater Noida, had added one more achievement in its enriched list of accomplishments, when Dr. H Chaturvedi, Director, BIMTECH, felicitated Prof. R. J. Masilamani with a copy of the book titled “TITAN – Inside India’s most successful Consumer Brand”. Prof. R. J. Masilamani, who’s been an alumnus of IIM, Ahmedabad, and a rank holder. He was selected for Tata Administrative Service (TAS), the prestigious industry cadre then. He served in the top management cadre at TELCO (now TATA Motors). He was also the Managing Director of the TATA group of companies and Timex Watches from 1991-2000. And served in TATA group for 35 long years. Recently a book titled “TITAN – Inside India’s most successful Consumer Brand” authored by Vinay Kamnath, Associate Editor, Hindu Business Line, has been published. The book narrates several events and anecdotes related to Prof. Richard Masilamani. So acknowledging R. J. Masilamani’s accomplishment Dr. H Chaturvedi felicitated him and presented a copy of the book as an honour in presence of all senior faculty members. 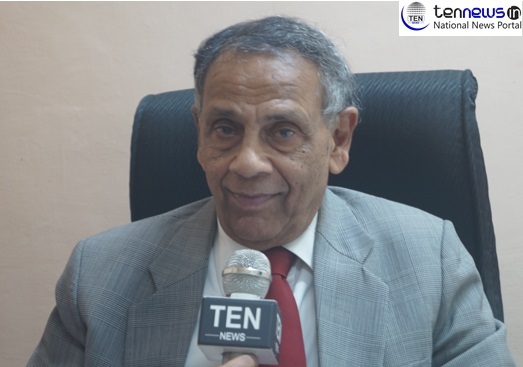 Today in an exclusive interview with Ten News, R. J. Masilamani shared his experience of his association with TATA group for 35 years and the key to his great bond which he shares with BIMTECH students. Apart from this he also shared his views on the interim budget of 2019. When asked about, How’s your Experience with BIMTECH? He said, “The experience here at BIMTECH for me is been very rewarding and gainful. We are a unique business school and have several faculty members who have industry experience and a passion for teaching. Students here are all very sincere and motivated”. You are often referred to as one of the most popular professors in BIMTECH? So what’s the key to this great bond with students? I believe that my duty and obligations were first and foremost for students. I teach them to help them with their projects, where ever they face problems whether its conceptual learning and with placements, I do help them on a priority basis. You are served as on a key position in corporate and now sharing this wisdom with students? What are those key points that you suggest students focus upon for to get their dream placements? I teach the basics of business and of various subjects and I am fortunate that my Industry experience has been very wide a varied so that very wide a varied knowledge I convey to the students. And apart from the concepts I also provide a lot of instances and anecdotes which illustrate the conceptual matter that I am teaching. Please tell us something about your 35 years of experience with TATA? I joined the TATA administrative service and I worked with TATA motors and after learning managerial capabilities, I got the opportunity to work in the Joint venture of TATA and Pepsico as a Vice President. That time we were responsible for setting up the first snacks plant in Punjab, where militancy was on its peak at that point of time. But fortunately, we setup the plant in a record period of time. Recently published book TITAN – Inside India’s most successful brand also has many anecdotes concerning you. Tell us something about the book? Yes, the book is very good and I am glad that I also had contributed to it. For me, this was my best experience, being a part of the joint venture of TIMEX and TITAN. Overall on a scale of 1 to 10 how would you rate India’s first budget that was presented by a Chartered Accountant turned finance minister? As this is the last year of government tenure, it was expected to be an on account budget without too many commitments which seem to be not followed as the budget with too many big financial commitments. And certainly, the last budget is looking at election prospects.